The difference in the lists below and on the next page highlights the difficulty in properly translating pneuma because it has so many meanings. It also highlights the absolute necessity to understand the context of each use of pneuma. If we do not understand what God is saying in the context, then it is very easy to mistranslate. The various ways pneuma can be translated into English is due in part to the fact that in the Greek Christian Scriptures pneuma appears in many forms. E. W. Bullinger wrote about the different ways in which the Greek word pneuma, spirit, is used (not what pneuma means but simply the way the word itself is employed in the Greek text). pneuma hagion (holy spirit) Matt. 1:18, and in 49 other places. hagion pneuma (spirit holy) 1 Cor. 6:19, etc. the hagion pneuma, Matt. 28:19, etc. the pneuma the hagion, Matt. 12:32, etc. It is used with pronouns: e.g., the pneuma of me: i.e., my pneuma, Matt. 12:18, etc. (en pneumati), by or through the Spirit: denoting agency. Adverbially, as meaning spiritually and sometimes (like en dolo), craftily, 2 Cor. 12:16): thus turning the phrase into an adverb. It is employed in combination with the Divine Names in seven different forms; of which four have the article, and three are without: e.g., pneuma Theou [spirit of God]; pneuma Christou [spirit of Christ], etc. It is employed with ten other nouns in the genitive case, which (by [the Figure of Speech] Enallage) qualify the meaning of pneuma. These again are used with and without the article: e.g., a pneuma of sonship (Rom. 8:15), i.e., a sonship pneuma. It is employed with a second noun with which it is joined by a conjunction (Hendiadys [the Figure of Speech]). Thus used it becomes a superlative adjective. Bullinger is surely correct that since God has chosen to use pneuma in so many different constructions, He must be trying to communicate many different meanings and emphasize different points. The realization of this truth has been hindered by the doctrine of the Trinity because Trinitarians tend to see pneuma as referring to “God the Holy Spirit” in a majority of the verses, even if the context militates against that interpretation. These are the various meanings of pneuma. (2) Pneuma is used of God, the Creator of the universe and Father of the Lord Jesus Christ. Matthew 1:18 says that Mary was pregnant through “the Holy Spirit” [pneuma]. Many other verses clearly teach that Christ was the Son of God the Father, here called the “Holy Spirit” (because God is holy and God is spirit). In Acts 5:3, Peter told Ananias, “…you have lied to the Holy Spirit…,” whom he identified in verse 4 as “God” via a parallelism. (3) Pneuma is used of Jesus Christ, the Son of God, in his resurrected body. Jesus was not a spirit being, like an angel (Luke 24:39), but his body was empowered by spirit in such a way that 1 Corinthians 15:45 says that he became a “life‑giving spirit” [pneuma]. After his resurrection, Jesus is occasionally referred to as “the Spirit.” “Now the Lord is the Spirit…the Lord, who is the Spirit” (2 Cor. 3:17 and 18). Christ is also referred to as “the Spirit” in Revelation 2:7, 11, 17, 29, 3:6, 13 and 22, as is clear from the context, where Jesus is the one doing the talking. Other noteworthy verses are Romans 8:16 (the first “Spirit” in the verse), Revelation 14:13 and 22:17. (4) Pneuma is used of the gift of God that was given to certain believers before the Day of Pentecost. Before Pentecost, when God gave His gift of holy spirit to people, He: (a) gave it to only some people, (b) gave different measures to different people, (c) could take it away from people, just as He did with King Saul and with Samson. As Scripture testifies, Jesus Christ had holy spirit put upon him: “…I will put my Spirit [spirit; pneuma] on him…” (Matt. 12:18). The gift of holy spirit came upon Jesus at his baptism in Jordan, and instead of being only a measure of spirit like that upon so many in the Hebrew Scriptures, Scripture states that Jesus was given “the Spirit [spirit; pneuma] without measure” (John 3:34 NRSV). 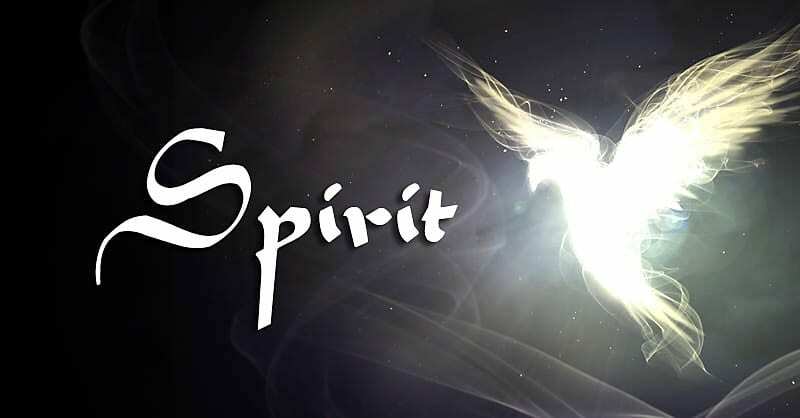 Thus, in Luke 4:18 NRSV, Jesus stated, “the Spirit [spirit] of the Lord is upon me….” Some other Christian Scriptures believers who had holy spirit upon them before the Day of Pentecost were Elizabeth (Luke 1:41), Zacharias (Luke 1:67), and Simeon (Luke 2:25). (5) Pneuma is used of God’s gift of spirit (usually called “holy spirit”), which has been given in birth to believers since the Day of Pentecost. Peter was filled with holy spirit (Acts 4:8). Paul, amazed that the Galatian believers would try to go back to the Law, wrote, “…Did you receive the Spirit [spirit; pneuma] by observing the law…?” (Gal. 3:2). When the Gentiles believed, they also received the gift of holy spirit (Acts 10:44 and 45). All of these uses refer to holy spirit, the promised gift of God that was given by Jesus Christ (Acts 2:33) to the Apostles on the Day of Pentecost and is now born inside each Christian. (6) Pneuma is used of angels, who are spirit beings. Hebrews 1:14 says, “Are not all angels ministering spirits [pneumata, the plural of pneuma]….” See also Hebrews 1:7, where pneumata is translated “spirits” in many versions, and “winds” in the NIV. (8) Pneuma is used of spirit beings that are not specifically delineated as either angels or demons in the Word of God. Acts 23:9 says “…some of the teachers of the law who were Pharisees stood up and argued vigorously. ‘We find nothing wrong with this man,’ they said. “What if a spirit [pneuma] or an angel has spoken to him?” Revelation 1:4, 3:1, 4:5, and 5:6 are other examples of this. (10) Pneuma is used of the individual and his attitudes, emotions, etc. A. Pneuma is used of the individual self. Matthew 26:41 says, “…The spirit [pneuma] is willing, but the body is weak.” Here Christ was referring to the “spirit” as the individual self, not the gift of holy spirit. B. Pneuma refers to personal emotion, attitude, thought, desire, or will. 2 Corinthians 7:13 says, “…we were especially delighted to see how happy Titus was, because his spirit [pneuma] has been refreshed by all of you.” The holy spirit born within a believer does not need refreshment. Thus, “spirit” here refers to his personal and emotional life, or possibly is used by the figure of speech synecdoche for his entire self (see #11 below). Referring to attitude, Matthew 5:3 says, “Blessed are the poor in spirit [pneuma]….” Obviously, “poor in spirit” does not refer to the amount of holy spirit one has received from God, but rather refers to an attitude of meekness in the mind. Galatians 6:1 says, “Brothers, if someone is caught in a sin, you who are spiritual should restore him gently (literally “in a spirit [pneuma, i.e., attitude] of meekness…). The NIV translators recognized that holy spirit was not being referred to, and used the phrase, “restore him gently,” to refer to a humble attitude of mind. A figure of speech in which a part is used for the whole (as hand for sailor), the whole for a part (as the law for police officer), the specific for the general (as cutthroat for assassin), the general for the specific (as thief for pickpocket), or the material for the thing from which it is made (as steel for sword). In Figures of Speech Used in the Bible (Baker Book House, Grand Rapids, MI, reprinted 1968, pp. 613–656), E. W. Bullinger gives many excellent examples of synecdoche in the Bible. Under the category, “The Part for the Whole,” Bullinger has 17 pages of examples. Among them are the following: “That no flesh [i.e., person] should glory in his presence” (1 Cor. 1:29 KJV); “…let us lay wait for blood [i.e., a person to kill]…” (Prov. 1:11 KJV); “…blessed are your eyes [i.e., you, not just your eyes]…” (Matt. 13:16 KJV); “… the froward mouth [i.e., froward speaking person] do I hate” (Prov. 8:13 KJV); “Their feet [i.e., they] are swift to shed blood” (Rom. 3:15 KJV); “…thy seed shall possess the gate [not just the gate, the whole city] of his enemies” (Gen. 22:17 KJV). Similarly, there are clear examples where pneuma (spirit) is used for the whole person. In Luke 1:47, Mary says, “…my spirit [not just her spirit, but her entire being] rejoices in God my Savior.” In 2 Timothy 4:22, Paul wrote, “The Lord be with your spirit [obviously not just Timothy’s spirit, but with Timothy as an entire person]….” This same expression also occurs in Philemon, verse 25. A figure of speech in which one word or phrase is substituted for another with which it is closely associated, as in the use of Washington for the United States government or of the sword for military power. We use metonymy in our speech when we say things such as “The White House said today… [i.e., a person in the White House”] or “Watch your mouth [i.e., be careful what you say].” Bullinger has 71 pages (pp. 538–608) of examples of metonymy in Scripture. A good example of metonymy is found in John 6:63, when Christ said, “…The words I have spoken to you are spirit….” Of course, the words themselves were not spirit, they were words, but they produced spiritual life in all those who believed. 1. The numbers in each column do not come to the same total for several reasons. Sometimes the Greek text from which one version was translated does not agree with the Greek text another version was based on. For example, the Greek text of Philippians 4:23 from which the KJV was translated from does not have pneuma, while the Greek text the NIV was translated from does. The Stephanus Greek text of 1550, which is close to what the KJV was translated from, has pneuma 385 times. However, the modern Greek text, which is closer to what the NIV and NRSV were translated from, has pneuma 379 times. However, sometimes the translators simply ignored the word pneuma and did not translate it (cp. Acts 19:21 NIV). Also, the translators sometimes added “spirit” when pneuma was not in the Greek text at all (1 Pet. 4:14 NRSV; 1 Cor. 2:14, first occurrence, NIV). 2. Bullinger, op. cit., Word Studies on the Holy Spirit, pp. 11 and 12 (his outline style has been reworked for clarity). 3. Most of the time psuche is used, it refers to the person, the individual, not just the life force of the body.